My name is Shirley Mendonca and I live in Modesto, Ca. My husband, Dave and I travel a great deal in our 39-foot Holiday Rambler motorhome. 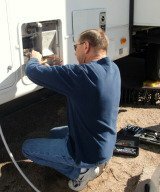 "We've been RVers for about 30 years. My husband and I are members of a tractor club that puts on tractor pulls at various places. He does the announcing and I help with checking in all of the tractors and 4 x 4 pickups." After I had open-heart surgery, I was concerned about how Emergency Medical crews would be able to find me quickly if "we were camping out in the middle of nowhere." 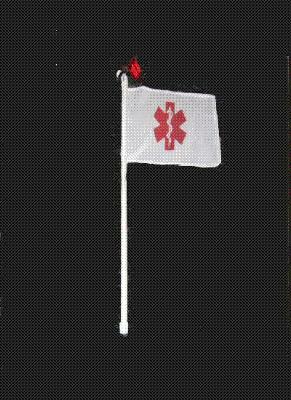 I've done a lot research and couldn't find any Emergency Medical flags anywhere. "So I made one." After talking with a number of RVers, I thought of others who may have medical concerns while traveling that may be interested in the flag. I decided to make the flags available for $20.00 plus $8.00 for shipping and handling . It's shipped in a heavy duty reuseable storage tube with ID label, glowing signal light and instructions. It also has a removable cap at the bottom of the handle so the flag can be slipped over a radio antenna. Please refer to our website for more details, photos and automated setup to order and ship.